If two or three different APC Senators present themselves to contest for the office of the senate president in the 9th Senate, then the PDP will shock them by producing both the Senate President and Deputy, because they will end up dividing their (APC) votes. This may likely happen. The purported endorsement of Ahmad Lawan for Senate Presidency by the APC National Chairman, Adams Oshiomhole is causing ripples within the party as a former Senate leader, Ali Ndume lashed out at Oshiomhole, describing the endorsement as totally unconstitutional. Lawan and Ndume are interested in the top position and have indicated their interest. Speaking with newsmen in Abuja on Tuesday, Ndume argued that Lawan’s choice as Senate President was an unpopular decision. According to him, both President Muhammadu Buhari and the National Leader of the party, Asiwaju Bola Tinubu, gave him their consent when he made his intention to contest the position known. 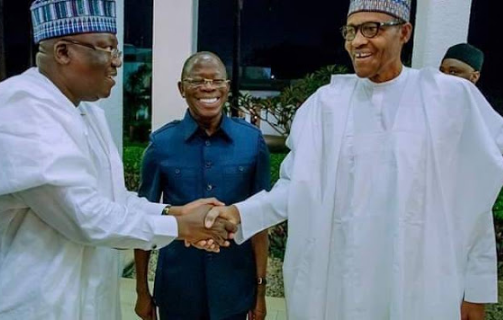 Senator Ndume said all his colleagues at the occasion Monday were shocked when Oshiomhole unilaterally announced his decision to endorse Lawan as candidate of the party.